David LeBlanc of the Physics department of Carleton University, Ottawa, Canada and the Ottawa Valley Research Associates, Ltd., is a highly regarded participant in Energy from Thorium discussions and a reactor scientist of considerable note. David is notable because of a significant accomplishment. He has simplified the reactor core to a point beyond which further simplifications are likely to prove impossible. David's reactor core is nothing more than two metal shells, one inside the other. A fluid fuel carrier/moderator/coolant flow into the inner shell, and then out again. A fluid containing fertile thorium flows in a and out the second, outer shell. That is it. The entire core structure is composed of two sheets of shaped metal, one surrounding the other, with openings through which a very hot salt fluid is designed to flow. In the inner chamber, fissionable material that is chemically bonded to the carrier salt becomes critical. No control rods are control rods are required to control David's reactor, because the inherent properties of the carrier/coolant salt automatically provide feedback that can control reactivity within the core and even shut the reactor down completely. on May 18, at ORNL. This talk will first review past and current molten salt reactor design principles covering the main development period at Oak Ridge National Laboratory (ORNL) as well as more recent work such as the Thorium Molten Salt Reactor of France (now called the Molten Salt Fast Reactor) and the FUJI concepts of Japan. Two new proposed design routes will then be presented. First a novel but simple core geometry modification to solve the issues that led to the abandonment of ORNL's Two Fluid efforts of the mid-1960's. Two Fluid designs have separate salts to carry the fertile thorium and fissile 233U and which benefit from greatly simplifying fission product removal but previously called for unworkable core architecture. Secondly, the untapped potential of ORNL's late 1970's work on denatured converter reactors termed DMSRs and proposed improvements will be presented. This more conservative route will be shown to also have attractive resource sustainability and long-lived waste reduction while requiring the minimum of development work and maximizing proliferation resistance. 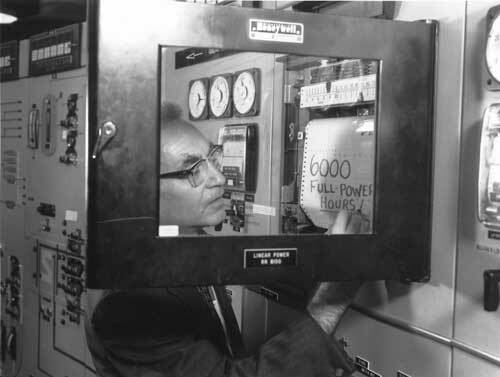 Alvin Weinberg and the ORNL MSRE at 6000 hours of operation. Would it not be advantageous if advocates of Thorium reactors could arrange to give some presentations in India? Are there any appropriate conferences or meetings? Although India has it's own long-standing approach, it is the country that seems most determined to use Thorium as their primary energy source in the long-term. Are Indian scientists/engineers/politicians open to other concepts? Anyone in the Thorium 'community' know the answer? SteveK9, the indians are aware, but are committed to their 3 stage program, and I suspect far from ready to change. I do have readers in india.
" The amount of uranium fuel needed—about 35 metric tons per GWe year—is only one-sixth of what is used by a pressurized water reactor. That means the price of uranium could rise an order of magnitude above its 2007 peak of $300 per kilogram before the fuel cost of a DMSR would reach even 1 cent per kWh "
Just curious about DMSR, what's the uranium enrichment, if it' s used low enriched uranium ? It is actually a fairly high level of enrichment. Enough U-238 is added to prevent the weaponization of the U-233 used to fuel the reactor. Charles; thanks for the heads up. You and David have done an excellent job of laying out the facts. It is obvious that we should be moving ahead with this technology at maximum possible speed. Charles, thanks for the very kind words. Alex P. Perhaps you are misreading my statement. At 300$ per kg the fuel costs would be roughly 0.1 cents per kwh but my comment was that they could raise by an order of magnitude (i.e. 3000$ per kg) before you'd pass 1 cent per kwh. It is actually about 2400$ to be exact (or 84 million for U plus about 5 million for enrichment and conversion gives 1 cent per kwh). Alex, the enrichment is variable. If we want the best uranium consumption we go up to the proliferation limit of 20% U235 for top ups (this allows the most thorium to be mixed in). At the other extreme we would use no thorium and enrichment would be about 4 or 5% (and uranium consumption might go up to 50 tonnes per GWe year). Yes we are in contact with the managers of their thorium program. They agree that the MSR looks like the best long term solution for utilisation of thorium for energy production. And they have been knowing this ever since the ongoing research at ORNL. IThEO will soon publish a "India Thorium Energy" report written by insiders and we hope it will be some interesting reading! Thanks Charles for all the good reading!